ABB. Bloomberg Businessweek Research Services launched a research program in September and October 2010 to determine the attitudes and opinions of energy industry executives and stakeholders with regard to the generation, distribution, and usage of global energy resources. The research program was designed to understand the future of the energy mar­ket and to evaluate the opportunities and barriers that exist in adopting new energy technologies. 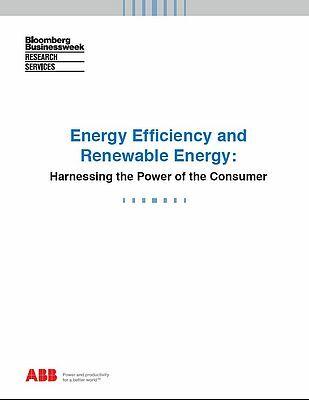 This white paper reviews a portion of the research and provides analy­sis and insights on the topic of energy efficiency and the future of renewable energy. The research program is an online survey of senior executives at leading large and mid­size companies who are deeply involved in the energy industry. Overall, a total of 486 energy industry stakeholders across the globe were surveyed in this research program. This project was funded by a grant from ABB.